March 8th marked the first of many wine tasting seminars we will be holding at Vini per tutti. We had the opportunity to share the evening with 6 passionate ladies, all with different backgrounds and knowledge about the wine world. 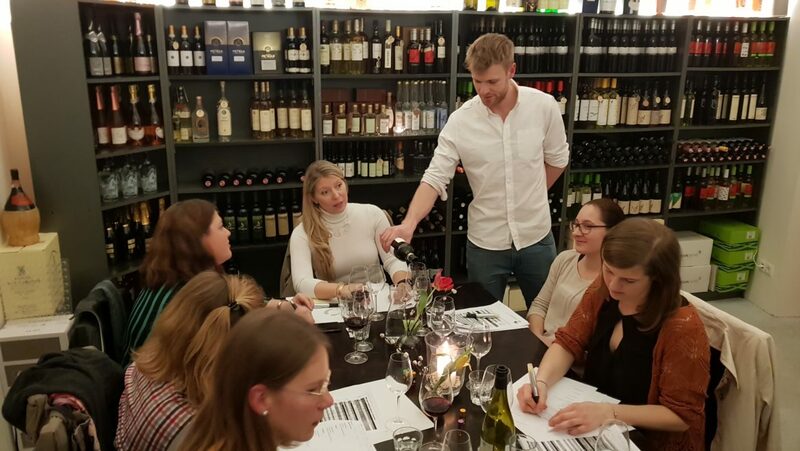 We took an introductory approach to the seminar, starting with the basics – we reviewed each specific element one should look out for when analyzing wines, using all the appropriate senses –sight, smell, and taste. Once we had finished going over the fundamentals we got down to the real business. 7 wines – each accompanied by a matching dish. Two Italian. Two Greek. Three Austrians. The Italian wines came from the heartland of Tuscany, both made by the prestigious Principe Corsini Winery, located 25 kilometers south of Florence. The 1st wine was a Vermentino 2016, more commonly produced in Liguria and Sardinia. Usually a relatively light-bodied wine with fresh citrus aromas and flavours, we approached this wine with idea of tasting a citrus intensive white, perhaps somewhat similar to sauvignon blanc. Oh how wrong we were… This Tuscan style gave us the tropical summer Vermentino. Mango, Pineapple, and lemon candy burst out of it- it surely gave us all a kick to start off the evening. We paired it with gorgonzola and the addition of a sweet baby apple and balsamico. Our 2nd wine from Principe Corsini was a Chianti Classico 2014. What seemed quite unbalanced with a bitter sharpness at first, eventually with some oxygen exposure, gave room to nice notes of sour cherry and plum, with mellow integrated flavours of oak. Great structure and flavours, it was a good choice for our first red of the evening. It paired deliciously with a tuna and sardines paste, topped with egg yolk all on a baguette slice. With the 3rd wine and fourth wine, we decided to focus on the region of Peloponnese, perhaps a region more known for its Kalamata olive oil today. Nevertheless, the wines were highly impressive. The first was a Moschofilero 2014, from the historical site of Mantinia, a high altitude plateau located north-east of Tripoli. The altitude makes the climate in Mantinia more continental than Mediterranean, despite its close proximity to the Aegean Sea. In fact, the region is one of the coldest wine-growing regions in Greece. Cool temperatures in the summer slow down the ripening of the grapes just sufficiently enough for the grapes to retain their characteristic acidity. Moschofilero is usually a variety that is drunk after a couple years after harvest – but made the right way it can no doubt last a little longer. Our 2014 by Innomessiniaki showed strong signs of primary fruit characteristics, followed by a smooth honeyed touch. There was harmony in its body, and its clean acidity kept its freshness intact. A very successful wine enjoyed by us all. We decided to pair this one with with a powerful octopus dish with balsamico and olive oil. Wine 4 was a bold one. Like a new world chardonnay, it boasted an oak intensity like no other. 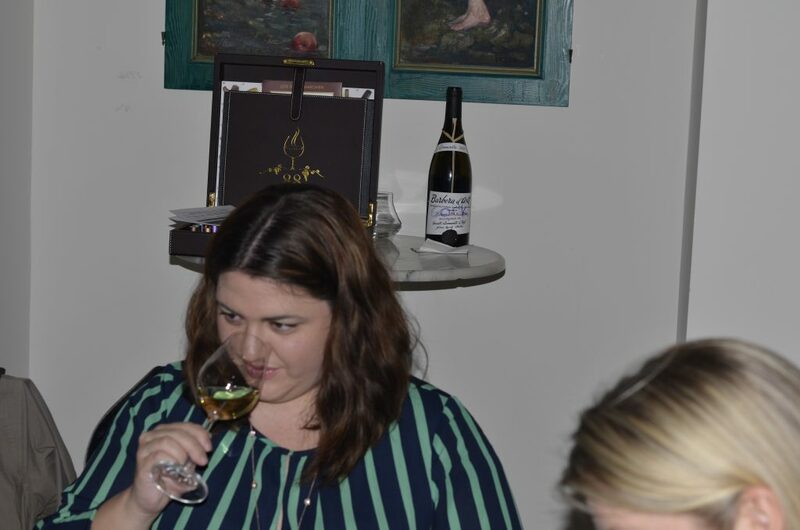 Chardonnay is only growing in popularity, and Greece in recent times has jumped on the wagon, producing some very nice expressions of the variety. With slight zest freshness, the wine is carried with overpowering structure with aromas and flavours of marzipan, brioche, toffee, chocolate and vanilla. The acidity keeps it exciting and doesn’t allow the oak intensity to over-do itself. 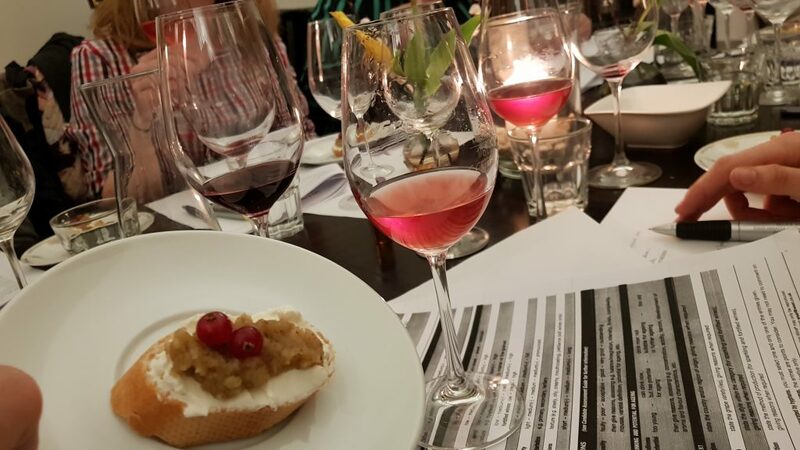 The wine seemed creamy, and so we took the opportunity to discuss malolactic fermentation, a process where wine-makers convert malic acid (i.e. acid found in green apples) to lactic acid (acid found in milk and dairy products). Thus the wine becomes creamier in texture and can develop aromas of butter and baked bread. We paired the wine with a goat cheese with green tomato marmalade and red pepper. Wine 5 moved us to the northern hemisphere to our lovely homeland of Austria. We started with an unfiltered rosè, made by the biodynamic winery Seymann in Karlsdorf, Pulkautal. Biodynamic and natural wine-making is a growing trend in the wine world so it was interesting to include a little taster of such an idiosyncratic wine. Biodynamic farming is originally an agricultural method of farming originally proposed by an Austrian philosopher by the name of Rudolf Steiner. Under biodynamic philosophy, all plants live in a middle kingdom empowered by energy coming from the soil beneath them and astral forces from above, by the sun, stars, and moon cycles. Therefore, viticulture techniques such as pruning and grape harvest is all done in accordance with lunar patterns. Quite a philosophical concept, it falls under the umbrella of Astrology and thus has inconsistent scientific backing. Nevertheless, the wine-makers at Seymann adopt a very natural approach to their wine-making, abstaining from sulfur use and keeping water waste to a minimum. Fertilizers are also avoided and replaced with “beneficial” pests that feed on any harmful pest or other unwanted microorganisms. The wine gave off a beautiful cloudy, salmon-pink color with aromas of bright red fruit, cranberries and sour cherries. In the mouth, the flavours were slightly more developed, but also maintained a slight bitterness. The body was incredibly structured and surprisingly balanced. Flavours lingered in the mouth after drinking the wine. We paired it with Ricotta, walnut pesto, topped with blackcurrant. Wine 6 and 7 were identical wines from different vintages, Panorama 2004 and Panorama 2011. They were produced by our friends at Rainprecht Winery in Burgenland and the wines were a cuvee made by Blaufränkisch, Cabernet Sauvignon, Merlot, and Zweigelt. The purpose of giving identical wines was to show how the environment and climate of two different years can influence the outcome of the same wine. The experiment was a success; we saw clear differences between both wines. 2004 was a difficult year for red wine in Burgenland. It was cold and there were unpredictable rain showers during the harvest period. Temperature can deeply impact fruit development as well as sugar levels. This can overall lead to unbalances in the final taste of the wine. We identified a certain “greenness” in the wine, flavours one could compare to green leaves or grass, or perhaps green bell pepper, a signature flavour of Cabernet Sauvignon. We also sensed a higher amount of oak usage in the wine. Indeed, the wine carried a much heavier, yet less integrated addition of oak aromas and sweet spice flavours. The 2011 vintage on the other hand produced a wine that received much acknowledgement with the other Burgenland wines of that year, being announced in Falstaff and winning numerous awards in international wine competitions.Indeed, the wine in a way carried itself with more confidence, and was not over-worked. It seemed like the wine-makers of the 2004 vintage gave slight sweetness and more oak to the wine in order to compensate for its lack of character. Contrary to this, the 2011 vintage seemed like it had not been tweaked with. The wine needed little alteration by the winemakers and was left with its primary expression. When a wine-maker can sit back and let the wine speak for itself, you know nature has taken control and worked in your favour. Ripe black berries, with structured acid and and soft tannin, the wine produced a velvety sensation in your mouth. We paired the last two wines with an artichoke paste with prosciutto and green olives – and a radicchio together with a Kalamata olive paste. Alles bestens to all women on their day last Friday. The tasting was 100% female except me and our marketing manager, Nondas. 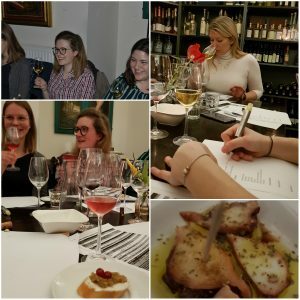 Women are more and more looking for wine knowledge and I can tell that girls are better tasters and more dedicated than men. Sorry mates! 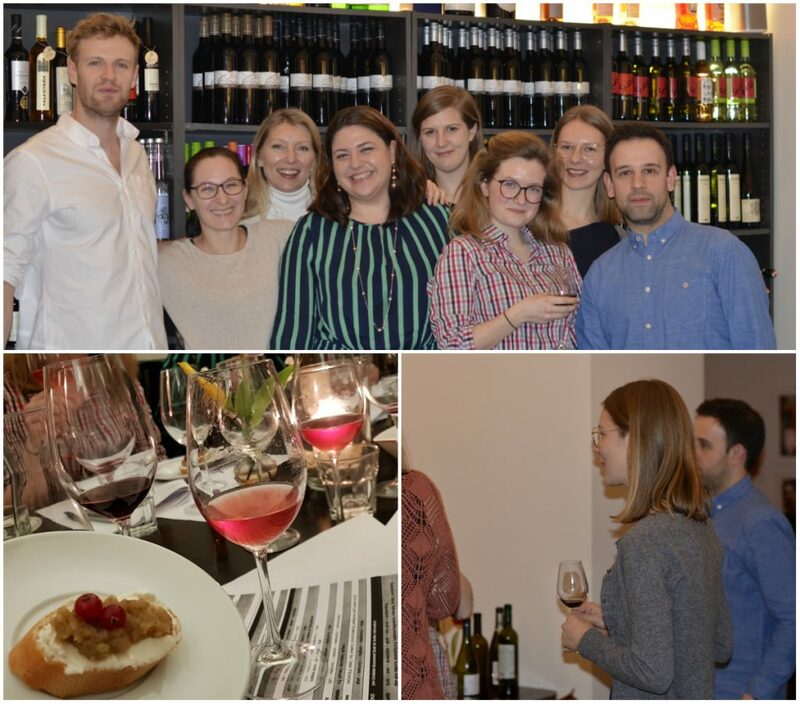 We will be holding another tasting again some time in April, stay in touch! WETTBEWERB: Gewinnen Sie einen Sauvignon Blanc Gamlitzberg Magnum!